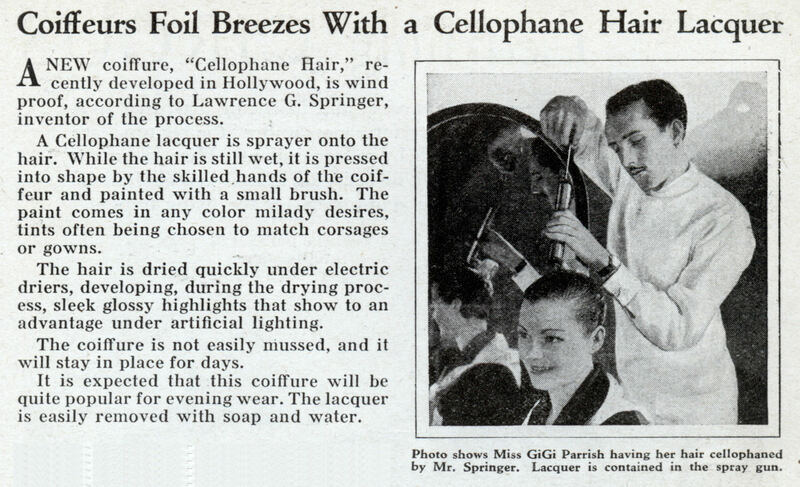 A NEW coiffure, “Cellophane Hair,” recently developed in Hollywood, is wind proof, according to Lawrence G. Springer, inventor of the process. A Cellophane lacquer is sprayer onto the hair. While the hair is still wet, it is pressed into shape by the skilled hands of the coiffeur and painted with a small brush. The paint comes in any color milady desires, tints often being chosen to match corsages or gowns. The hair is dried quickly under electric driers, developing, during the drying process, sleek glossy highlights that show to an advantage under artificial lighting. The coiffure is not easily mussed, and it will stay in place for days. It is expected that this coiffure will be quite popular for evening wear. The lacquer is easily removed with soap and water.